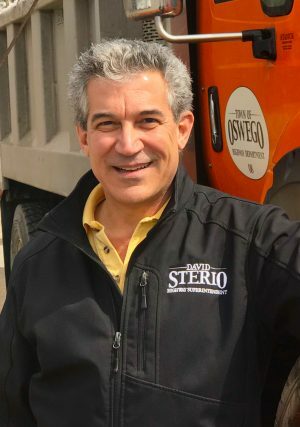 Oswego, NY – David Sterio has announced his candidacy for re-election as Highway Superintendent for the Town of Oswego. Sterio, who resides on Valley View Drive with his wife Jill (Hadlow), has been serving the four-year term position of Highway Superintendent since January 2016. A registered Republican, Sterio has received the unanimous endorsement from the Oswego Town Republican Committee, and will be running on the Republican, Conservative, and Independence lines. “I greatly appreciate the positive support and encouragement of the Town of Oswego residents, as well as the endorsement from the Oswego Town Republican Committee once again for this election,” Sterio said. “The successes that we have seen over the past four years within the Highway Department is truly my commitment to the taxpayers of the Town. Through proper management, organization, attention to detail and clear communication, my focus has been first and foremost to service our residents. 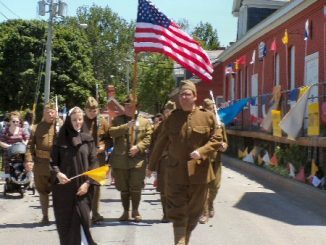 “That focus, has in turn resulted in tax decreases, grant monies, and overall savings and efficiencies for the Town,” he added. During his first term, Sterio has eliminated deficit spending within the department; created reserve accounts for future expenses; and “right-sized” the fleet of vehicles and equipment. For 2019, the Highway Department had its first tax decrease in over 10 years. Furthermore, Sterio has established greater communication with surrounding towns, the City of Oswego, and elected representatives in Albany, including both Senator Ritchie and Assemblyman Manktelow. According to Sterio, one example of the importance of these partnerships and communication, was securing $200,000 in grant money from Senator Ritchie for the purchase of a new snowplow for the Town. Additionally, during his first year in office it was determined by the Department of Transportation that the Rathburn Road Bridge in the Town of Oswego was in need of full replacement. Sterio was asked by the Town Board if the bridge could be built by the employees, rather than hiring the job out to a contractor in an effort to save costs. The end result, however, was a $200,000 savings in budget costs for the project, as well as a recognition by the American Public Works Association for “Transportation Project of the Year,” according to Sterio. “This is truly a full-time position, with a full-time commitment to our residents,” said Sterio. “I don’t take this job lightly, and am extremely passionate about the expectations of the position, knowing full well the seasonal responsibilities we have to our Town. “I am enthusiastic about continuing to build on the success over the past four years, and look forward to talking with everyone as I go door-to-door from now until the primary on June 25th,” he added.